Defending champion Matthew Fitzpatrick will take a two-shot lead into the final round of the Omega European Masters after carding a bogey-free third round of seven-under 63. The Englishman posted five birdies and an eagle in Switzerland to move to 14 under overall. France's Mike Lorenzo-Vera dropped just one shot in a six-under 64 to move up to second. England's Daniel Brooks is one of five players tied for third at 10 under. 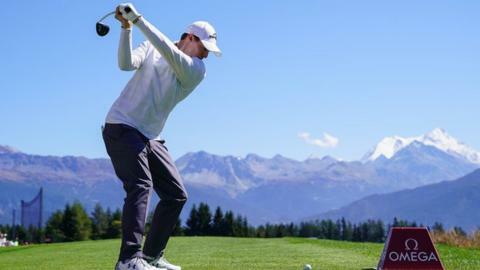 Fitzpatrick missed the cut on his first visit to Crans-sur-Sierre Golf Club in 2014, but finished second in 2015 and seventh in 2016 before winning his fourth European Tour title there last season. He began the third round two shots behind Japan's Hideto Tanihara, who slipped down into a tie for 10th at eight under after a third round of 71. Fitzpatrick is looking to become the first player to successfully defend the title since Seve Ballesteros in 1978. "He is a good man to emulate, so hopefully things go to plan tomorrow," Fitzpatrick said. The 24-year-old described his third round as "really, really good", adding: "I would say that everything went well today. "I drove it really solid and made some great up-and-downs, which has been a bit of a struggle this season to keep the round going. There were some real key ones today and that was the difference. It kept the momentum and I managed to kick on. "You still want to put the pressure on and make birdies. You are going to have to, because someone is going to come up from somewhere tomorrow, there is no doubt because you can get it going. Hopefully I'll stick to my game plan and make plenty of birdies."